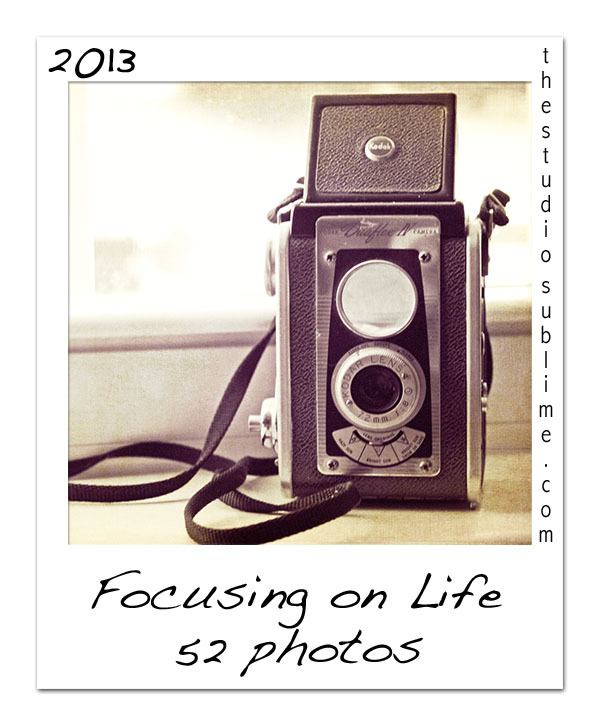 As I've mentioned a few times this week, I'm participating in Sally Russick's Focusing on Life photography project this year. Basically, she gives us prompt each week and on Saturday we share our photo for that prompt. I'll admit that I'm hoping to use this project as a way to learn more about my camera in addition to having a cool collection of photos. 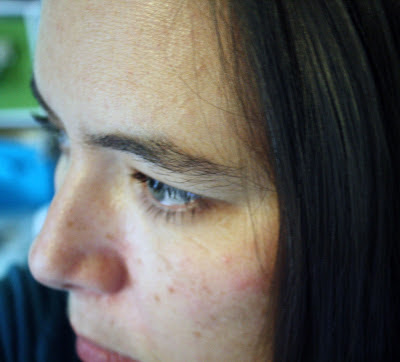 This week our assignment was a self-portrait. I visibly shuddered when I read that e-mail from Sally. I'm no fan of having my picture taken or shared, but I want to be fully committed to this yearly challenge. I started out trying to take this by just holding the camera at arms length and pointing the lens at my face (teenage girl cameraphone style) and moved on to actually trying out the timer on the camera as Sally suggested. The timer function was much easier to use than I anticipated, and I am really glad that I've already learned something new about my camera. (WIN) I took a BUNCH of pictures of myself, weeded those down to four, then to two, and finally decided that THIS would be the photo I share with you. I kinda hate that this is so similar to the sample photo of herself that Sally shared with us in her e-mail, but it really is my favorite. So there I am for all of you to see. I can't wait to see what Sally throws at us next. For now, you can head over to Sally's blog, The Studio Sublime, for a complete list of participants. I have somewhere to be in the morning and won't be able to hop until later (maybe even Sunday. . .booooo.) I can't wait to see each of you! I think it's a gorgeous photo Hope, you look wistful. I'm doing a a photo a day for 365 days and I'm dreading the self portrait one on the last day of January. I'm following the prompts on "fat mum slim" blog and just using my iphone and different photo apps. I've started another blog http://daviniasdailyphoto.blogspot.com.au/ to document them. Great photo. Love the pensive pose. I think this has been hard for all of us. You did great. Great job.. love the result. I joined this hop for all the same reasons that you did, and I, too learned about the self-timer feature. Sweet! This is a great shot! See you next week! It seems like most of the participants prefer to be behind the camera and not have it pointed at them! My problem with self timers is I get bored before it goes off and move! Although my life as a blur would be appropriate? Hey cutie! You know I just love those freckles! So glad to hear what you all are learning in this project! I have yet to figure out the timer function on my camera...and it will be fun to put all of these photos together after a year..beautiful self portrait..I love the angle too!!! Very nice picture. I have not posted yet, but I guess by the time you are able to hop you will see that my photo is pretty much the same, a side view instead of a full on. I think this is going to be a lot of fun and look forward to each week's prompts. It's a wonderful photo. It makes me wonder what you are looking at. It's funny how so many of us were shudding at this prompt, but ended up with such wonderful pictures. Hope, you captured a beautiful self portrait. You have such beautiful skin tone, I bet it really sets off those pretty eyes and dark hair I'm catching a glimpse of! Glad you learned something new about your camera!! What a lovely photo! You look deep in thought here. Like you, I was just happy to learn how the self timer worked, since I failed at using any of the other buttons on my camera. Now where is that manual 'cause I think I'm gonna need it. Gotta love that timer! What a nice shot. Looking forward to the weeks to come. I gave up on the timer thing and regressed to my teenage days of point and shoot....60 some pics I believe. I think Ms Sally hit home with all of us rather stay behind the lens! Great Photo Hope! You look deep in thought. You are Gorgeous! This is a great photo. You have kind eyes! I like using the self timer on my camera for group shots. Everyone gets tickled watching the light blink and hearing the beeps. Everyone is laughing and the picture is always great. Love this composition! I think we are all have a hard time with this one but I think everyone is doing a fab job for this week. I can't wait to see what you have for us next week! Great pic Hope - intriguing, close cropped shots always make me want to pan out to see what was going on around. I think you did great! I cheated and had to have my niece take my pic because it was of me twirling my hair (so me) and I couldn't for the life of me get it to work w/a timer! Or w/my point and click little camera or iphone! Shirley - Oh my freckles! Mine are so intermittent and random, but they're mine. I think I'll keep 'em ;) Thanks so much! Shel- I can't wait to see your photo with the twirling hair. I like that you 'composed' it. I was just trying to get a shot that didn't pick up ALL my flaws! Thank you! A lovely photo. I was the same tried taking without the self timer and then with and found it so much easier with it. Love the photo, and the freckles too. I'd forgotten all about using the self timer, must check if I have the feature on my iPhone. Hope this is a great shot, like you were caught deep in thought and there seems to be a light source reflecting on you which gives a nice glow and doesn't lose your features in shadows! I love the angle you chose! neat! And a lovely photo it is, too! Great job. And kudos for already learning something new.